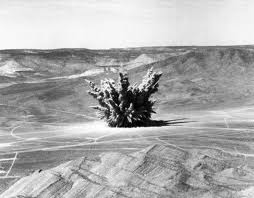 In March 1955, I was assigned by the Geological Survey to observe an atomic test shot in Nevada. 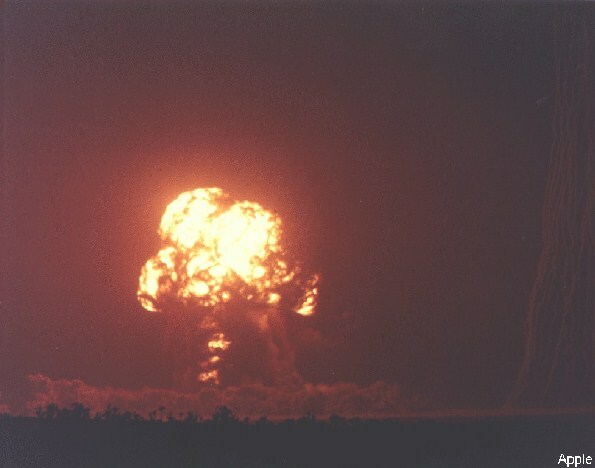 The particular shot was known as Teapot Ess, a shallow underground burst intended to test the ability of “atomic demolition munitions” to create craters in the earth. This was of interest to the office of the U.S. Army Chief of Engineers, with which we were engaged in a cooperative program of military geology. Make no mistake: In the mid-fifties, many of us construed the opportunity to observe an atomic explosion as somewhat of an honor, perhaps, and most certainly a high adventure. After all, this subject had dominated the news in the previous ten years, and the weapons development and testing program was one of the government’s most important activities in this period. These were times when many of us tended to believe our leaders more often than not; and they had assured us all that the tests were perfectly safe – safe for observers and participants, safe for people of the neighboring towns, the nation, and the world, and safe for the environment (though not many even thought of that word in 1955). Of course, a few dissenters worried about strontium-90 in the food chain and about strange quirks in the weather. But that was all sort of long-term, and shouldn’t spoil the fun of watching a blast or two! So I arrived in Camp Desert Rock, Nevada late one starry but moonless night. 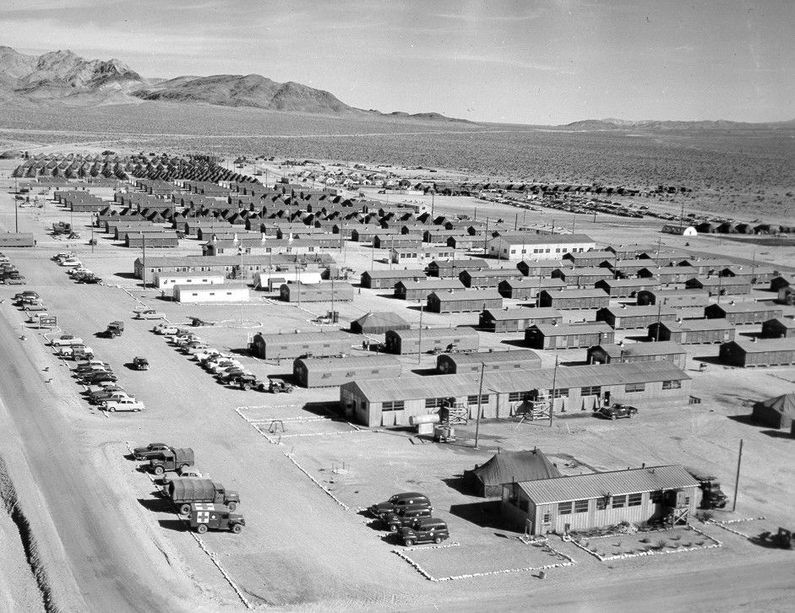 The c amp, some 50 or 60 miles out of Las Vegas, was almost completely described by its name; all that remain to be mentioned are the 12-man tents in which test observers were housed. I remember the “moonless” detail of my arrival because, once the jeep had dropped me off with my baggage in front of my assigned tent and departed, I could not see the tent but had to feel for it. If there was a darker place that night than under the stars, it was in the tent. I felt my way inside, cheered on by snores, grabbing a toe here and a nose there, until I found the only remaining vacant cot. One wakeful soul warned that everything was covered with soot because the wind had earlier blown the stovepipe down. But, as I sat on my cot in the profound darkness, removing suit, tie, white shirt, etc. (yes, that’s how we dressed up for plane flights in those days), I couldn’t think of any way to make practical use of his warning. I soon learned that, because of schedule changes, I would also be witnessing the Teapot Apple shot, followed by Teapot Ess a day or two later. A couple of days after my arrival, after all the usual briefings, safety and security lectures, field trips, and general atomic orientation, about two or three hundred of us observers boarded buses at about three in the morning and raced off at 35 miles per hour toward Yucca Flat. Most of the observers were military officers, but a few such as myself were civilians in military support programs. Warned of cold nights, we wore blankets and as many layers of clothing as we had been able to accumulate, plus steel helmets furnished by the management. After a two-hour drive, we were dropped off along trenches at a distance, as best I can recall, of 2,500 yards from a well-lighted steel tower 500 feet high. After the buses departed, the tower seemed to grow ever taller as it dominated our otherwise dark desert world. We knew we could not escape it, for to walk to a safe distance would take longer than the remaining time before the shot; our only survival would be right here in the trench. The Teapot Apple shot, which we were here to witness, produced a yield of about 15 kilotons (TNT equivalent) of explosive power, as I understood it at the time. More recently published records vary wildly as to the intended and actual yields, but that is someone else’s problem, not mine. After a 45-minute wait, mostly spent stamping feet in an attempt to keep warm, we heard sirens and loudspeaker commands to get into the trenches. This immediately revealed a problem that had been obscured in the dark. Winds during the night had partly filled the trench with sand, reducing its depth from 5 or 6 feet to about two and one-half feet. All parts of our bodies had to be at least 2 feet beneath the ground surface for safe cover. And we could not lie flat. We had been warned to keep one knee up under us to provide sufficient lift in case the trench should collapse on us. In short, the problem led to a flurry of bare-hand digging in the loose sand almost until shot time. At the first hint of dawn, excitement was escalated by sirens, horns, beepers, and a backward-counting voice on the loudspeaker. I assumed the one-knee-up, face-down position, secured the steel helmet, covered all with a wool blanket, closed my eyes, and wrapped my right arm over my face. As the zero count was reached, a light penetrated all these covers and obstructions to strike my eyes with the brightness of a candle held 2 or 3 inches from the closed eyelid. Almost immediately, the trench began to rock, throwing and bumping me from one wall to the other. After probably 4 or 5 very lengthy seconds of this, the blast arrived, crashing and reverberant, akin to the sound of a lightning bolt far too close for comfort. It pierced and agonized my ears, knocked the helmet off, and brought a rain of stones and sand into the trench. A few seconds later we were told to stand and look. While distinct echoes of the blast continued for some thirty seconds, we saw the mushroom cloud, haloed with a violet glow, already high overhead. As we continued watching, it rose from perhaps 10,000 feet to a level of about 20,000 feet, at which it began to drift downwind away from us. Sparks continued for some time to shower in the vicinity of the tower stubble. We walked for some unspecified reason toward Ground Zero, trusting implicitly in the sergeants reading Geiger counters, until they told us to stop and turn back. I often thought about the motives of the United States Government in transporting ultimately hundreds of thousands of observers and participants, most of them soldiers, to these tests. I suppose the principal motive was to train a generation of troops that would be familiar and at ease on the nuclear battlefield. This didn’t work for me, even after I had ultimately witnessed four atomic shots. I came to fear and detest the thing more by having seen it. Its savage fury, even without human victims, had visceral effects raising all sorts of emotions, mostly akin to horror and culminating in tears. Then I thought of a scant ten years earlier, when on two separate occasions a great many human victims had been in such hellish eruptions; and more tears came. A couple of days later I witnessed the Teapot Ess shot, a shallow underground burst which tested cater-forming effects. Compared to Apple, Ess was decidedly unspectacular and anticlimactic. The best I can say for its large, low, chicken-shaped dusty cloud is that it trapped much more of the radioactive debris in local fallout on the Test Site, as opposed to the tower and aerial bursts which generally managed to salt most of the earth with their poisons. There is a humorous footnote to the interest by the Army Chief of Engineers in crater-forming effects of atomic explosions. Subsequent small-scale tests established that a whole row of explosive devices, spaced at just the right intervals, could produce a huge but very neat trench, not at all the scallop-shaped hole in the ground that one might expect. Fifteen years after Teapot Ess, the Sierra Club was engaged in a series of attacks on the environmental record of the Army Corps of Engineers. They even resorted to humor, in the form of a fictitious article in their magazine concerning the Cro-Con Canal, allegedly a secret project of the Corps. The name of the canal was a shortened version of Cross-Continental. The canal was to be a deep-water, sea-level trench crossing the United States from one coast to another. Deep-water ports would be created at such unlikely places as Denver, Colorado. And how would all this excavation be done? You guessed it: A long row of atomic explosions. The Sierra Club made it clear that all this was fictitious humor, but it gave weary environmentalists a much-needed opportunity to laugh. This entry was posted in Travel Adventures and tagged Atomic testing, Corps of Engineers, Nevada, Nuclear weapons testing, Sierra Club, Yucca Flat. Bookmark the permalink.